For years, there has been extensive talk of “managing” China’s rise, promoting the peaceful resolution of conflicts, and lamenting Beijing’s encroachment in the South China Sea. The US has announced her “Pivot”, Japan has reinterpreted her constitution, the Philippines have initiated international arbitration proceedings, Vietnam has kept rearming, and Russia has kept including tactical nuclear weapons in her Far East “counter-terrorism” exercises, just to name some of the most relevant developments. To no avail, China has followed the same relentless path of territorial expansion, which reached a new plateau last year with the combined deployment of an oil rig supported by myriad fishing and state vessels near Vietnam, and the launch of a major reclamation drive, while naval construction continued apace, supported by the expansion of maritime militias. Despite all this, or perhaps because of it, there is some evidence that analysts are ready to consider measures almost unthinkable of until recently. In her recent report titled “Conflict in the South China Sea”, Bonnie S. Glaser (Senior Advisor for Asia, Center for Strategic and International Studies) has sent two significant shots across China’s bow, suggesting sanctions against energy companies involved in the South China Sea, and the use of US Navy warships against Chinese coastguard and other state vessels. These two proposals may just be suggestions, but they merit careful examination on at least two counts. First of all, because they suggest novel solutions to a long-recognized problem, which current policy does not seem to be having a significant impact on. Second, because they come as some other voices are suggesting withdrawing from the South China Sea, giving up the region and concentrating on the First Island Chain. Such move may prompt a miscalculation by Beijing, and unravel the web of alliances among maritime democracies in the Pacific, including extended deterrence. China’s rise rests on a combination of integration into the world economic system and use of limited force to achieve foreign policy goals. While the latter is often lamented, until recently the former has not been questioned. Proposals to deal with China’s rise have failed to contemplate sanctions as a tool to constrict Beijing’s behavior. It is true that, to some extent, a move away from manufacturing in China is already apparent. This seems to be, though, mostly due to economic reasons like rising relative wages and a wish for diversification. However, perhaps some “hidden sanctions” are already in place in the case of, for example, Japan, with some actors understanding that in the current atmosphere it is unwise to keep transferring manufacturing capacity to her neighbor. Before examining sanctions, perhaps we should ask ourselves some questions. Do we really need China that much? Have many countries become over reliant on the Chinese market and Chinese capital fluxes, prompting Beijing to believe that she is so essential as to be indispensable? Is this one of the underlying causes of China’s aggressive behavior in the South China Sea? Does Beijing believe that economic factors guarantee a ceiling on any reaction by the maritime democracies, ruling out any meaningful response? While we shall not try to answer them in detail, it seems clear that Beijing has indeed succeeded over the last three decades in becoming a pillar of the international economic system, as clear from, among others, the country’s significant portion of world manufacturing, her growing presence in many markets, the gradual internationalization of her currency, and her leading role as energy and commodities importer. Some voices doubt the sustainability of Chinese economic growth, but at least for the time being there is little doubt concerning its contribution to Chinese power and influence, as clear from Beijing’s latest move, setting up of the Asian Infrastructure Investment Bank (AIIB). Thus sanctions, even if strictly limited and carefully targeted, should ideally be preceded by a debate on the above points. A debate bringing together specialists in economics and national security, two communities which do not always communicate that well. Two important aspects of sanctions are their effective impact, and Beijing’s possible counter-sanctions. Concerning the former, it is unlikely at this stage that China would stop exploration and drilling in the South China Sea. Too much is at stake, in terms not only of national prestige and self-image, but also of economic development and national security. Furthermore, any suspicion of weakness in dealing with foreigners may be taken badly by citizens. Many observers stress how the Chinese regime is increasingly relying on nationalism to preserve its legitimacy, but a look at history shows how this has not just been one of the hallmarks of the CCP from day one, but how it runs deeper in contemporary Chinese history. The 100 anniversary of the Great War should serve as a reminder of how the May the 4th Movement erupted following the failure of the young republic to secure anything at Versailles, despite the contribution of the Chinese Labour Corps to the Allied victory. With regard to Chinese counter-sanctions, again this would be nothing new, since Beijing has never been shy over the last three decades in using her economic might to achieve foreign policy goals. Just to mention an example, forcing the Netherlands to stop submarine sales to Taiwan. Thus, any detailed proposal for sanctions should contemplate the different scenarios, their impact, and how to react to them. This does not mean that the shadow of Chinese reprisals should rule out any sanctions policy. This self-defeating view would only embolden Beijing. What it means is that we must recognize that playing the sanctions card demands a re-examination of economic relations with China, something perhaps necessary anyway, given the destabilizing impact of persistent trade surpluses and the accompanying capital flows. Thus, by upping the ante in the South China Sea the maritime democracies may be killing two birds with a stone, making it clear to Beijing that they are not surrendering, and bringing forward a very necessary but much long delayed debate on the place of the Chinese economy in the world. Glaser argues that “The United States should be prepared to respond to future Chinese coercive acts including using U.S. naval forces to deter China’s continuing use of “white hulled” paramilitary vessels”. Concerning this, it is clear that Washington cannot stand idle as the South China Sea, not only because of its importance in terms of SLOCs (sea lines of communication), but because it would mean an open door to further acts of aggression, the loss of American credibility, and serious doubts about extended deterrence in the Pacific. 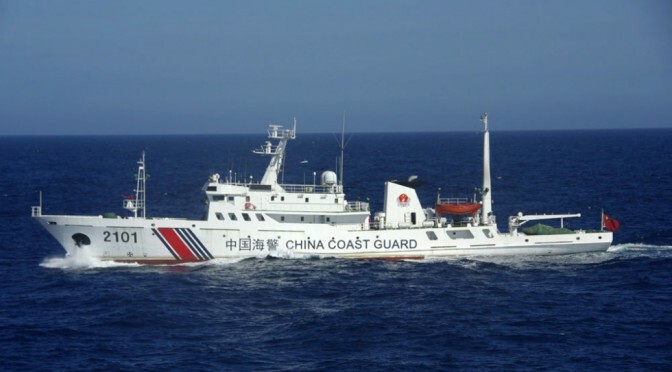 It is also clear that, since the United States do not have coast guard or equivalent units deployed in theater, or large numbers of trawlers and merchantmen capable of being employed in a dual role, a symmetric national response to China’s tactics is not possible. Does this mean that the US Navy should be employed against Chinese coastguard and other state vessels? It is indeed a possibility, but it raises many questions, and ideally a discussion should be accompanied by a parallel examination of alternative options. When discussing gray on white, natural caution and fears of escalation militate against this possibility. Yet, at the same time, the question arises why we should play by China’s rules. For years, the mantra that navies only confront navies, has mainly benefited China. There is no much point in reinforcing the US Navy in the Pacific if it is forced to contemplate, impotent, how Beijing achieves her goals using a mixture of other assets, from oil rigs to fishing vessels, including maritime militias and state vessels. Letting the other side lay down the rules is a sure way to defeat. A problem, though, is that conventional naval vessels are designed with lethal force in mind. Thus, other than ramming other ships or blocking their way, the other manners in which they may be employed would involve kinetic means leading to loss of life and a substantial escalation. Concerning ramming and blocking, the United States simply lacks the numbers to respond in this way. There is some quality to quantity, and Chinese numbers are simply impressive. China knows that other countries do not want to be seen as having fired the first shot in what may soon turn into a regional conflagration. The challenge then is how to avoid firing that first shot, without losing the current limited conflict already taking place in the South China Sea. Escalation may not be an alternative option, but surrender is not either. Glaser’s suggestion should not be dismissed out of hand, and in doctrinal terms could be compared to Russia’s concept of “de-escalation”, raising a confrontation by one notch in order to bring it down. The problem is not doctrinal, but political, since it is doubtful whether maritime democracies are ready to follow this approach. However, there are other alternatives that merit some serious discussion. Just to mention one, a permanent land deployment in disputed islands, before China had the chance to seize them, could exert a stabilizing influence. Such deployments may be carried out by the countries involved, yet with a US rotational presence. This would not only aid in developing the necessary interoperability skills, but would send a powerful signal to Beijing, avoiding any perception that the South China Sea is just home to some far away rocks of little concern for Washington and thus ripe for the taking when the moment is right. Conclusions: a first step in the right direction. The Center for Strategic and International Studies’ Contingency Planning Memorandum Update is a step in the right direction, putting on the table two options hitherto considered taboo in discussions on how to deal with the South China Sea conflict. At a time when some other observers are suggesting we scuttle the Pacific, using some to the same words (like “rocks” and “far away”) that history shows prompt miscalculations by would-be aggressors, they make it clear that the game is not over yet. Maritime democracies may lose it, but not without a fight. Concerning sanctions, they would show Beijing that other countries mean business, and are ready to go beyond posturing. While unlikely, at least in the short term, to change Chinese behavior, their absence from the negotiating table weakens the maritime democracies’ case. Any detailed consideration of this weapon, however, requires not only an examination of the different retaliation scenarios, but a wider reflection of the Chinese economy’s place in the world financial system. An examination that is anyway necessary, and has been unduly delayed, and which is therefore an additional reason to seriously consider Glaser’s words. With regard to gray on white, the current dogma that navies only fight navies is clearly benefiting Beijing and can no longer be merely repeated mantra-like, unless we are ready to lose the battle while some of the most powerful weapons simply look on. However, this does not mean that this is the only option, or that it is one politically acceptable. Thus, the time has come to examine the different possibilities, one being the permanent deployment of land forces on disputed islands, with a rotational US presence. Previous PostJoint Warrior 2015 InfographicNext PostOBANGAME EXPRESS 2015: Two steps forward. One step back.